FUTURES First Year Teacher Award program recognizes beginning teachers who exceed district expectations. All nominees are honored at a reception in the spring and each receives a certificate of achievement. Our Mini-Grants encourage and support teachers and administrative staff who have great ideas for creative use of curriculum that will provide enhanced learning experiences for students. Mini-Grants enable the purchase of special materials and resources for the classroom and are intended to support projects that are not provided for within school budgets or through other means. Visit www.FindItFundItFlorida.com/Volusia to view this year's projects, many of which still could use funding. FUTURES receives funds via the Consortium of Florida Education Foundations (CFEF) from legislative funding for the School District Education Foundation (SDEF) Matching Grants Program. The impetus of this program is for communities to support their school districts and requires money to be privately raised by the public school(s) of Volusia County for the specific SDEF projects. These private funds currently are matched dollar for dollar through this legislatively funded program. FUTURES facilitates this grant program and this year's focus areas are on Low-Performing Students and Literacy. 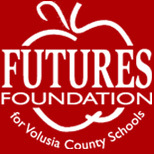 The Superintendent's Outstanding Achievement Award is co-sponsored annually by FUTURES Foundation for Volusia County Schools and the Volusia County School District. It was initiated to honor support staff members who have demonstrated outstanding commitment, teamwork, cooperation, and innovation in the workplace. FUTURES facilitates the local Take Stock in Children (TSIC) program which offers its students college tuition scholarships, caring volunteer mentors, and hope for a better life. Take Stock in Children Volusia raises funds for these scholarships through individual, community, civic and private donations. All contributions currently are matched 100% through legislative funding for the Stanley Tate STARS (Scholarships For At-Risk Students) Program through the Florida Prepaid Scholarship Foundation. Students selected into the program must maintain a 3.0 weighted cumulative GPA throughout high school, attend required events and meet with a volunteer adult mentor on school campus for 30 minutes weekly during the school year. They must also remain alcohol, crime, drug, and gang free. FUTURES partners with the Recruitment Department within Volusia County Schools to provide support for their recruitment initiatives for new teachers. This support includes hosting a reception welcoming Job Fair attendees to Volusia County. Developed by FUTURES Foundation for Volusia County Schools, Tomorrow's Leaders is a leadership training program designed for high school juniors. Through a series of structured activities and events, Tomorrow's Leaders participants meet and interact with community leaders who share their career knowledge as well as thoughts and concerns about current local issues, community resources and various factors impacting the future of Volusia County. The Tomorrow's Leaders Program prepares students for constructive leadership, responsible citizenship and active participation in the affairs of Volusia County and beyond. Our Teacher Mini-Grants Program has funded more than $1.8 million into more than 4,000 grants for classroom teachers throughout the years. Mini-Grants fund the costs associated with student supplies, curriculum materials, books, software programs, etc. providing a multitude of activities, including both remedial and enrichment programs.